UN Secretary-General Antonio Guterres on Friday presented four options aimed at boosting the protection of Palestinians in Israeli-occupied territories, from sending UN rights monitors and unarmed observers to deploying a military or police force under UN mandate. - Providing a "more robust UN presence on the ground" with rights monitors and political officers to report on the situation. - Pouring in more UN humanitarian and development aid to "ensure the well-being of the population." - Creating a civilian observer mission that would be present in sensitive areas such as checkpoints and near Israeli settlements, with a mandate to report on protection issues. - Deploying an armed military or police force, under a UN mandate, to provide physical protection to Palestinian civilians. In the report, Guterres said the United Nations was already undertaking many protection initiatives but that "these measures fall short" of the concerns raised in a General Assembly resolution adopted in June. In that measure, the 193-nation assembly condemned Israel for Palestinian deaths in Gaza and tasked Guterres with the drafting of proposals for "an international protection mechanism" for the Palestinians. 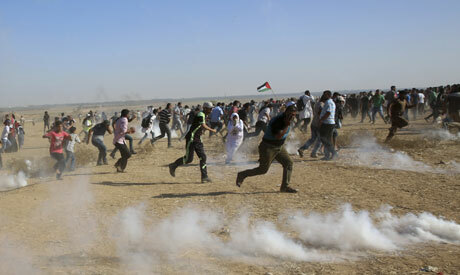 Guterres argued that a political solution to the conflict was needed to address the safety of Palestinians but that "until such a solution is achieved, member-states may further explore all practical and feasible measures that will significantly improve the protection of the Palestinian civilian population." "Such measures would also improve the security of Israeli civilians." "The targeting of civilians, particularly children, is unacceptable," Guterres said in the report, adding that "those responsible for violations of international humanitarian law must be held accountable." UN efforts to ensure the well-being of Palestinians must strengthened, he added, singling out the funding crisis at the UN's Palestinian refugee agency UNRWA as being "of particular concern." UNRWA is facing a major budget shortfall after President Donald Trump's administration decided to withhold its contribution to the agency. Palestinians in Gaza have for months been demonstrating against Israel's decade-long blockade of the territory and in support of their right to return to lands they fled or were driven from during the war surrounding the creation of Israel in 1948.